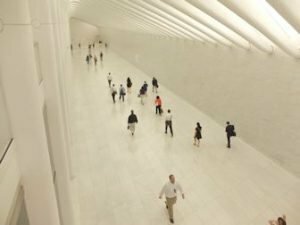 World Trade Center Transportation Hub is the PATH-station and it’s corresponding public transport and shopping complex, located in the Financial District of Manhattan. As a result of the attacks of 9/11, the area was entirely devastated. Yet reconstruction soon began and in 2016, the process was crowned with the opening of the rather distinctive above-ground section, the Oculus. The World Trade Center Transportation Hub serves as a station for various forms of public transport and is also home to a large shopping centre. 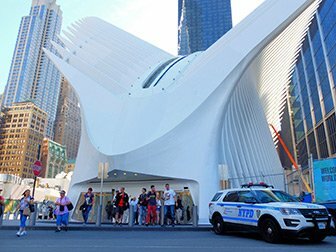 The World Trade Center Transportation Hub was designed by Spanish architect Santiago Calatrava. His vision of a large hall, fully lined with white marble has come to life. The hall, partially situated under the 9/11 Memorial is connected to the impressive above-ground section, the Oculus. 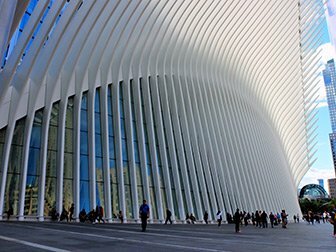 According to the designer, the Oculus, positioned between 2 and 3 World Trade Center, represents a bird. Furthermore, in the roof of the Oculus, you can see a narrow opening. Every September the 11th at 10:28 am, the sun shines directly through it: the exact time when the second of the Twin Towers fell in 2001. The World Trade Center Transportation Hub is owned by PATH, The Port Authority of New York and New Jersey. The hub is a major PATH-station, where lines Newark – World Trade Center and Hoboken – World Trade Center connect. In addition, the station links PATH-trains with various New York metro lines and the nearby Battery Park City Ferry Terminal. The station is therefore a ‘competitor’ of the two other major stations in Manhattan, Penn Station and Grand Central Terminal. Another of the hub’s major functions is that of a shopping centre. 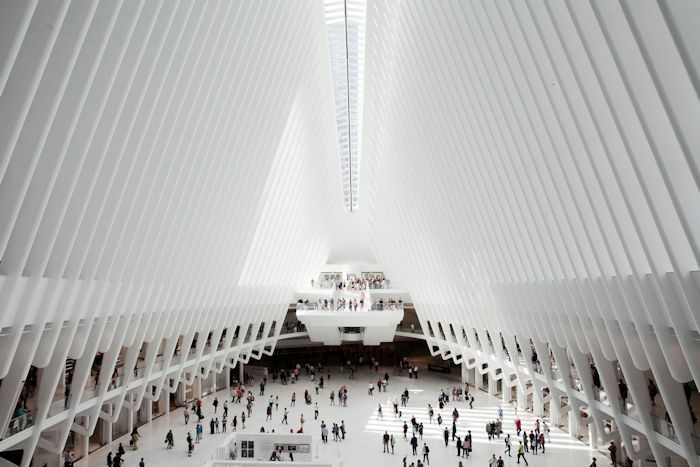 The Westfield World Trade Center Mall has been established in the vast hall under the Oculus and also in towers 2 World Trade Center, 3 World Trade Center and 4 World Trade Center. With close to 34,000 square metres of shopping space, it’s the biggest shopping mall in Manhattan. There are even free movie screenings in the summer. Here you can read more about the Westfield World Trade Center Mall.